During much of 19th century US slavery, enslavers would often use the term “our family, black and white” to describe their relationship to the enslaved population. This was one of their many justifications of slavery: people of African descent were like children and must be controlled by the “father” of the plantation. 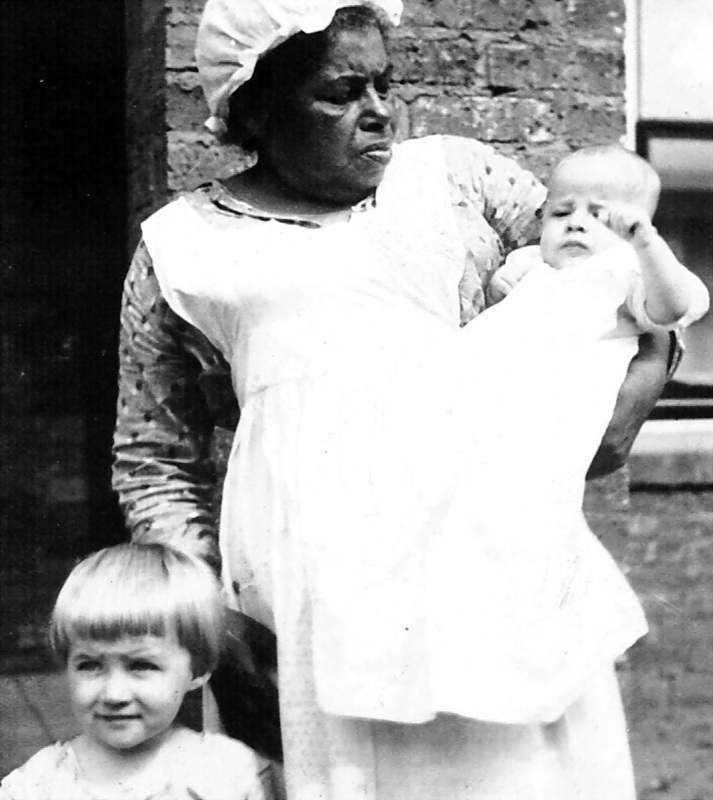 The “mother” figure of the plantation was often considered the “mammy” who was stereotyped as a large, jovial, kerchiefed black woman beloved by everyone on the place. This caricature of a sexless, maternal, and non-threatening figure with innate powers of goodness is familiar to us in books, and in the films they inspired, such as An Imitation of Life, Gone With The Wind and To Kill a Mockingbird, to name only a few. My mother and uncle with unknown African American woman circa 1920. But what of the biological children of these women? According to Afro-Jewish scholar Lewis R. Gordon, most African American people in the US today has a mother, grandmother or other relative who worked as a domestic in a white household, helping to secure the educational future of a child in a world where whites were either apathetic or cruelly and formidably against African American agency. The children of these women must have had feelings of anger, sadness, shame, loss and confusion when their own mothers left for the white family’s home. As adults, I wonder what impact these feelings have had on their lives today? How do these emotions affect their understanding of the world and inform their behaviors in the present? The white children raised by these women may have also had comparable feelings. Often the African American housekeeper substituted for the white child’s own mother; her absence due to death or mental illness or simply disinterest. What happened when the caretaker left or was fired? Or the child became of an age when they no long needed her in the same way. How have these children’s feelings been expressed in their adult lives? 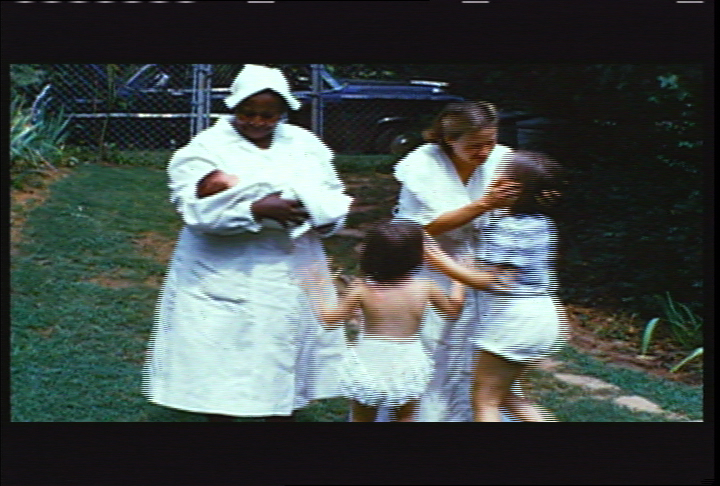 In 1992, I began producing Shared History, a film about the relationship between my white family and African Americans descended from enslaved people my ancestors owned before the Civil War. When I spoke about the film before and after it was broadcast, white people would often come up to me to tell me in a whisper of the beloved African American woman who raised them—who saved them from a childhood of isolation and despair. Time and time again, deep emotions were expressed about their love for their African American caretaker and their belief that she loved them too, rarely questioning how the inequalities of the relationship might have influenced the caretakers’ actual view of her job and the children she raised. Even so, some African American caretakers and their families have maintained a relationship with the white now-adult children well after the caretaker’s retirement. In some of the cases, families have come together and made an effort to talk about the racially charged context of their connection as well as details of the mother’s life that might not have been known to one another. Their conversations produced a deeper understanding of the plight of all involved in the relationship especially the woman who straddled two worlds. These adult children have experienced within their own lifetimes a version of the old plantation relationships of the antebellum south passed down through generations to the present. They are linked to a past that benefited whites and took advantage of blacks but, still, one that offers an opportunity to navigate the paradoxical truths of their connection with compassion for each other. The following video interview from the blog Just Like Family with Faye Williams and Katherine Robertson show these two people trying to come to terms with their shared relationship. From slavery through the 20th century, each generation of my slave-owning families was raised by African American women—including myself. As a newborn, I was brought home from the hospital in the arms of an African American nurse, Geneva, who had taken care of my three older sisters when they were babies. After Geneva, there were always African American women in the household to clean and watch over me and my sisters. My mother was busy with the Junior League (shades of The Help) and the housekeeper took care of us after school. The memory of these women and the stories of others compelled me to create, Just Like Family, a blog where black and white people can share their experiences, stories and thoughts that honor and memorialize the person who meant so much to them from their different perspectives. The blog examines the mythology of the “beloved” African American caretaker beneath the stereotypes that lie at the foundation of most of our conversations about race. It considers the themes of loss, confusion, anger and sadness as well as love and understanding in intimate bi-racial relationships in the last half of the last century while attempting to give voice to a history and experience not often acknowledged in this country. Most of the posts in Just Like Family so far are those written by white people about the African American women who raised them. There is an outpouring of remembrances about the comfort and safety they felt in the relationship as well as expressions of grief, loss and shame for vanished opportunities to show their gratitude or because they knew so little about their caretaker’s life. It’s telling about my own ingrained biases and limited experiences—seen through a cracked though permanent lens of white privilege–that I have found it difficult to interest African Americans in posting their stories and memories, which would obviously present very different and much-needed points of view. I admit I have trouble talking about this topic at all because of the inherent tension in the subject; white children were nurtured, while black children were left behind. This provokes an old discussion about the African American family that I’m not qualified to open up but one that I hope more learned readers will engage. I can imagine, though, that perhaps for some African Americans, the experience might be too close, personal or disturbing to make sharing their feelings comfortable at this time. Connecting with whites through slavery may seem safer than remembering in the near past how, for instance, a grandmother endured the racism she may have encountered while working for a white family. In a letter-to-the-editor in the Utne Reader, one African American reader responds to a story of a beloved house servant that might articulate a view some African Americans may have on this subject. I admit that I am moved by many of the stories I hear from white people about their African American caretakers. But ultimately, however loving these relationships may have been portrayed by either side, these connections were compromised from the start—flawed by racial discrimination and inequality. In the end, it was still a bond based on the exploitation of black people by white people. There are many questions raised by the stories shared in Just Like Family that this post cannot begin to answer. But I hope that the post and the blog inspire conversations that can help explore these questions and possibly link black and white adult children to each other in a connection of healing and reconciliation as a way to celebrate the woman who nurtured them both across the color line. I invite readers to participate in Just Like Family by authoring a post providing your own views or writing of your own experiences to help ensure that more diverse voices are heard. Please leave a comment for this post or contact me at ffurman@ecentral.com. My maternal grandmother, Nina, never forgot all her long life the African American woman called Aunt Sammy who looked after her when she was a child, and whose daughter, nicknamed Scissorbill, was Nina’s first best friend. I tell about them, and about my grandmother’s early recognition of the inequity and iniquity of a system in which a beloved member of the family had to enter that family’s home by the back door, in my current book project, ‘Tangled Vines’ (https://www.facebook.com/slavesinthefamily). Thank you, Felicia! Thank you, Felecia, for this beautifully written and well thought out post. Yes, the distance of several generations may make it easier, ironically, to connect with those linked through slavery pre-emancipation. Finding focus close-in is always a challenge. I’m glad for the chance to see portions of your film, and hope to see all of it before too long. I know how whites saying that the black people whom they enslaved or who worked for them afterwards are “Just Like Family” is such a trigger because so hypocritical. This is like a raw wound between black and white people that comes right into the present. In fact the “Nanny” relationship is a major way that black women’s bodies and mothering and lives have been colonized since slavery and continue to be — taken over and used by whites to the great detriment of their own children. Although it is hard and embarrassing to look at, I was a participant in these harmful social relations. I can speak from my own experience as a pre-school child who felt a natural love for the black woman who cared for me when my mother left me with my grandparents in order to follow my father’s assignments during WWII. I fully admit that I had no clue or concern about the feelings of Mary’s own children and what they went through when she left them to take care of me each day. I was also wholly unaware of the context of exploitation (I’m certain that like other black women in that time in Missouri, it was one of the only jobs she could have to help support her family and even more certain that she was paid very little). Finally, I was susceptible to my parents’ and grandparents’ disregard of my love and dependence on her. If I later figured out how much I resented my mother leaving me, I can’t imagine what Mary’s children must have felt… Since we moved to California right after the War, I never had a chance to find out. How can this situation NOT bring up feelings of rage and bitterness among the black children and feelings of shame, confusion, and guilt among the white child benefactors? Thank you, Ann, for your passionate response. Felicia, your story is an elegant illustration of how both conscious and unconscious discrimination based on race can operate within the most well-meaning individuals and families, how children can be soaked in the culture of white privilege and become adults oblivious to their privileged past and present. You grew past the obliviousness to write this story, but the impact of the structures lingers, at least in my life. My parents and grandparents always had “help” – cooks, housekeepers, nannies – always women, always from a less privileged group, either Irish or African American. That’s the way it was, and that was the way it was supposed to be. We were benevolent, condescending, and disinterested in the lives these women put aside to be at our beck and call for long hours, even over weekends. We were consciously racist and classist sometimes, probably always discriminatory unconsciously, and unthinking about our privilege except to say that we had “earned” our comfort, affluence, social position, and opportunities. I find it takes regular thought and self-examination, regular attention to my own behavior and that of people around me, to flush out those unconscious beliefs and to notice my privilege at work. Since we live in a linked world – we are all linked as individuals and through social structures – every story and every reflection on the beliefs and behaviors that affect others is part of understanding and evolving our bittersweet linkages. Prinny, thank you for *your* beautiful words. I think back to all the women my ancestors leaned on, women who had to leave their own families to bear up under that leaning. It’s been reported recently that we bear within us the DNA of everyone with whom we have ever been physically intimate in our lives. I think that is also true of the people who eased the lives of our ancestors at cost to their own physical and emotional freedom. We are who we are because of them. I try to live in thankfulness for what they gave to make me who I am. I appreciate your acknowledgement of the reluctance of African Americans to participate in this dialog. It can be painful for us to understand the roles of our grandmothers in your homes. My Grandmother Smith worked for local families in support of her family. She was “respected” for her contributions to their day-to-day lives. But she paid a price at times that must have been overwhelming for her. Grandmother Smith was bi-racial and given up at birth to an African American family. Her mother returned to her family, but was not to her original status. One day my Grandmother Smith was responsible for preparing and serving a luncheon that was attended by some of her mother’s family (aunts and cousins). She preformed her duties with dignity, but did take an opportunity to remind those ladies who she really was. It was after her mother’s death that she showed more respect for her mother than her Smith family. She saved up enough money to have her mother moved from her original grave to a plot in the Smith section of the cemetery. She made sure her sons know who their Smith grandmother was and where she was buried. They passed the this history on to us. I’m glad your grandmother asserted herself and told the white women who she really was, maintaining her dignity in a tense situation. I think there are many stories of how African American women in these situations used dignity to empower themselves and to ensure that the whites knew they were dealing with someone who had reason to spin out of control but chose not to for their own sakes.